I've been traveling these past couple days in Australia with the wonderful Niki Buchan who is sometimes referred to as "Nature Niki," a woman I'm learning is well deserving of the nickname. I've meet few people who are as truly passionate about nature and educating children in nature. My first evening in the country, we spent our evening in downtown Brisbane, where she joyfully gave me a tour of the city's resident birds, bats, and trees, naming them teaching me how to identify them, and otherwise whetting my appetite for what she assured me would be only the beginning of my experience of Australian wildlife. Among the subjects we've spoken of at length has been sticks. I suppose that's as inside baseball as it gets for progressive, play-based, early childhood educators. I really can't imagine how tremendously tedious we've sounded to those who've overheard us: And, honey, these two adult people at the airport spoke for a half hour about sticks! But in our world, and the world of just about every child I've ever known, sticks are vitally important, and infinitely useful things. 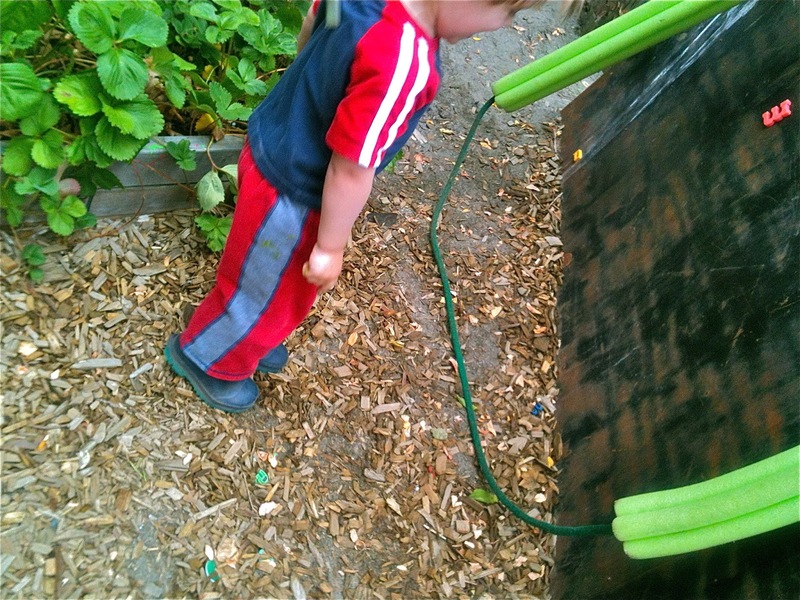 More than one child at Woodland Park has his own "stick collection" at home. At any given moment there will be at least one, usually more, children walking around with a stick in his or her hand. We draw on the ground with sticks. We count sticks. We break them into smaller sticks. We look for longer sticks. We discover thicker sticks or thinner sticks or sticks for stirring or poking or throwing or for using as a drum stick when the actual drumsticks somehow come up wanting. It's got me thinking that there are a few other simple, versatile tools like that we have out there in our outdoor classroom. 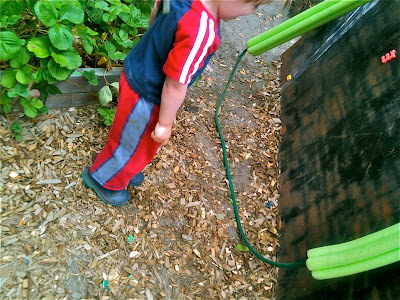 There are rocks, of course, and we find any number of uses for the wood chip ground cover we've laid down across our space, but as I scrolled through my photographs, I noticed a man-made one turning up over and over in all sorts of play situations: ropes! I reckon I'm as interested in ropes as I am in sticks now that I think about it. We keep a dozen or so, perhaps more, ropes lying about our space, almost like parts of the landscape. Most are of the 4-6 foot variety, easy to handle, made of cotton or nylon, but there are longer ones out there, usually found tied to something via complicated knots of a child's invention. And there are even longer ones stashed away in the storage shed should we need them. As with sticks, we've found, ropes are infinitely useful turning up in just about every game we play, machine we invent, or activity in which we engage. The sad part is that many schools, as with sticks, have chosen to ban ropes. We heard yesterday about a school that punishes children simply for the act of picking up a stick, interpreting that act as intent to hurt someone. Ropes, while perhaps not as common as something that fall from trees, suffer from the same sort of irrational prejudice. Ropes and sticks, just like any tool, have a potential dark side, of course. As Ani Defranco has said, "Every tool is a weapon if you hold it right," and we can all see she's right if we're willing to engage in catastrophic thinking. But learning to avoid the dark and engage the light always stands at the heart of education. 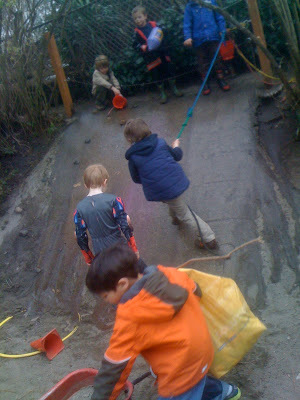 Removing sticks or ropes or anything with a pointy bit or scratchy part, I think, impoverishes our children's education in the name of an impossible standard of what we narrowly call "safety." What sets the human animal apart is our ability to invent and use tools; it's one of the things that makes us truly human, and we lose a bit of what we are, and hide a bit of what we can be, when there are no sticks or ropes in our lives.